Newly established festivals Comunité in Tulum, Mexico and Manana in Santiago de Cuba, Cuba share a similar mission: to provide musical platforms for their local communities. Their models represent a departure from more traditional electronic music events that often import foreign talent and forgo indigenous musical traditions. We sat down with Juan Del Valle of Comunité and Harry Follett of Manana to talk about the importance of preserving Latin America’s musical heritage, the philosophies governing their respective festivals and the collaborations that they’re planning for the coming year. Juan Del Valle: We decided to start Comunité because of our profound love for music and Mexico and because there aren’t any local festivals in the Riviera Maya—the area where you can find Tulum, Playa Del Carmen and Cancún. By “local festivals,” I mean events that are produced by Mexicans and that work alongside local communities. This festival is one of our ways of decolonizing our country and supporting the communities around us. We integrate the area’s culture into the event as much as we can by giving design and construction jobs to indigenous communities, as well as by permitting the sale of local crafts and goods within the event. We wanted Comunité take place in Tulum because my partner David House and I are both deeply inspired by the ancient Mayan cultures that used to live here. These civilizations had a great connection with nature, and we try to translate these values into the ethos surrounding the event. Everything used in the festival, like beverage cups and stage designs, are made from compostable materials. This obviously skyrockets the cost of production, but it’s a risk that we’re willing to take in order to make people more conscious of the ecological and cultural richness that the space has to offer. We also try to focus on bringing together different micro scenes and artists from Latin-America that aren’t typically seen in the same place. Over the course of the last two years, we’ve worked with artists from Peru, Argentina, Colombia, Chile and Cuba. These connections that Comunité has to the local community are what makes it such a unique initiative. Harry Follett: Manana is similar—it’s really because of the musical richness of Santiago and the people there, like our co-founder Alain Garcia Artola, that this festival exists. I initially went out to Cuba a few years ago with the intention of recording with Alain and studying percussion, but the teachers I had were so open and so interested in helping me get involved in the culture and the musical community there that I ended up staying. This was how the festival was born. After only a couple of months of studying and listening to rumba, and other forms of the Haitian and Yoruba styles of music found in Santiago, Alain and I kept asking ourselves, “How does this relate to electronic music? How does this relate to electronic artists? How can we make a musical connection here?” This was the most fun part about creating the festival for me, because it meant thinking about how to make a coherent lineup and a party that multiple cross-sections of musicians could enjoy. It’s a real job to be able to create a platform for people from different cultures to share their knowledge and to collaborate together in a meaningful way. JDV: Yeah. I also really want to support local artists, but sometimes it’s difficult to grow a scene from scratch and to break with the brand names that are capitalizing off of our country. I used to work in corporate banking for eight years, and I interacted with a lot of oil, construction and mining companies. These imported festivals work in the same way as other big corporate organizations that lack real, non-marketing-focused interactions with local communities and artists. It’s kind of like a blurry smoke screen within the local economy, since in the long run, all of that capital generated leaves a hole in the country’s growth. They’re just soulless entertainment centers. Comunité is a response to this phenomenon. We book Latin American talent and partner with local initiatives to promote the colorful art that we as Latinos have to offer. One of my dreams would be to start making more of an impact on electronic music events by booking Mexican artists at European festivals instead of the inverse. HF: Totally. It’s really hard to get a scene going organically—especially in Santiago de Cuba, where people haven’t had any exposure to electronic music. I wanted Manana to be a collaborative experience that allowed electronic music and local music to meet. 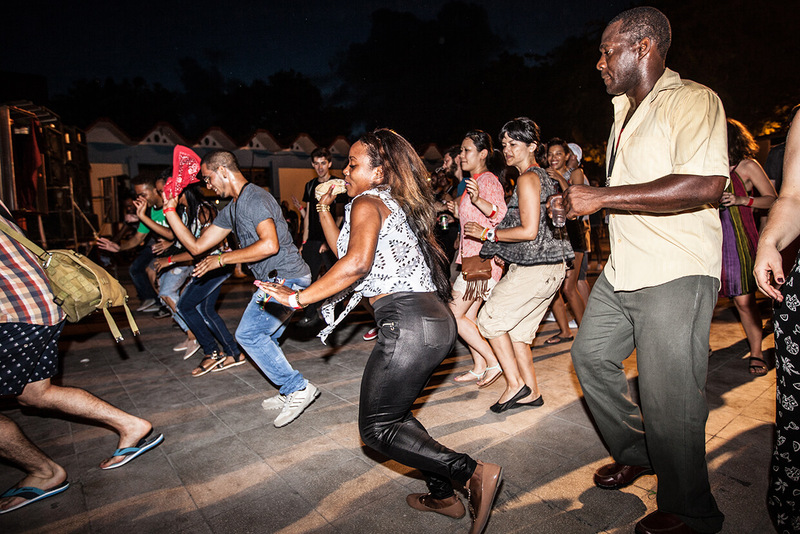 We invited some international electronic music artists to come in the month before the festival so that they could meet local musicians, see ceremonies and reggae street parties and immerse themselves in the music so that when they did work with Cuban musicians for the festival, it was a balanced musical exchange. Soundspecies from the UK did a brilliant collaboration with a local bembe group called Ache Meyi, which drew on Santiago de Cuba’s Haitian influences. We also had Nicolas Jaar in the studio recording with musicians from the rumba group Obbatuke. Some of these groups have stayed in contact and are continuing to make music—I think about seven in total. JDV: I’m really amazed that a festival like yours is happening, Harry. It says a lot about the cultural shift that’s going on in Latin America these days. I immediately fell in love with Manana the moment I saw electronic music mixed with Latin artists. I’m super, super amazed with all of the work you’ve done. HF: Well, you helped us a lot in the early stages. You were one of the first people who got in touch, and we hit it off straight away in terms of our taste and our goals to integrate local music with electronic music. It’s because of people like you and the rest of the team at Comunité that we got the contacts we needed in the local music industry. I think you’d agree that the connection between Mexico and Cuba is an important one musically, and it’s good to be able to do something practically to support it. JDV: Yeah, there are a lot of genres that people listen to in both countries. The majority of people in Mexico and Cuba listen to salsa, cumbia and rumba. A lot of this music started in Cuba, and from Cuba it branched out into almost a thousand other sub-genres throughout Central and South America. I think what you and I have tried to do is to bridge a cultural divide that’s absent in a lot of European festivals. We’re both really interested in connecting what’s going on at a global level with Latin America’s musical roots. HF: And more than its musical roots, its spiritual roots. A lot of the Cuban music at Manana has origins in African religions, all of which have developed in unique ways on the island. We made sure to spend time with influential priests and figureheads within these communities to ensure that we were developing Manana in a way that was respectful, and to understand what was allowed in performances. You can’t use certain drums in certain spiritual performances, for instance. You can’t change the structure of certain songs. You have to understand the hierarchy of the players. And if you’re visiting people’s houses, you have to understand how their religion works. A lot of the culture there is about respect. JDV: With all of this organization and coordination in mind, do you think that you’ll be able to put Manana on again this year? HF: We have plans in place for our second festival to take place in February 2018. All of our efforts so far this year have been going into showcasing the best collaborations from Manana 2016 at The Barbican in London, as well as launching Manana Records. Our first release by Santiago’s rumba pioneers Obbatuké just came out, and there will be two pretty incredible collaborative albums out by Ariwo and Soundspecies before The Barbican show this May. JDV: The Mexican crowd is really interested in Manana, and it would be great to work on doing more co-productions between our festivals, like when Comunité brought Manana artists like DJ Jigüe to play last year. Maybe we can showcase some Latin American artists at Comunité first and then bring them down to Cuba. HF: That would be amazing. I think we need to do everything we can to make sure there’s a lot of sharing going on between the electronic scenes in Mexico and Cuba, and to create new musical projects that cut it on a world level. The thing to think about moving forward is that this connection shouldn’t only be about the frequency of how many times we can have Cuban DJs playing in Mexico and how often we can have Mexican DJs coming to Cuba. I think what’s really important is giving local and visiting artists more musical references so that they can really experiment with the sounds, rhythms and melodies of Latin American countries. Cover photo of Manana courtesy of Harry Follett.